…a leader…must be willing to delegate: if you want a team to make decisions, you must give them decisions to make. A good leader should make as few decisions as possible. The final question considered by the Roundtable was: What are the characteristics of a leader who can take an organization through a major transformation? What do leaders need to do to prepare their organizations and its talent for future challenges? Do effective leaders need to be visionary founders like Steve Jobs or Jeff Bezos or charismatic figures like John Legere? Marc Spiegler came to Art Basel from a career as a freelance journalist. Since he had had neither training nor experience as a business leader, much of his learning was on the job. Among the first things he realized was that he had to lead the organization in a time of rapid, continuous change and in an environment that was being constantly inundated by news and information. Even while he is making plans, things are happening that he has not taken into account. To illustrate the nature of the challenges he and other 21st century leaders faced, he described a work of art that was created as part of the 2012 Art Basel Miami Beach. The artists (a French team known as Kolkoz) took a rendering of a normal beach soccer field and created a three-dimensional representation of the Apollo landing site on the moon on it, then invited a group of gallerists, critics, and artists to attempt to play a game of soccer on the field. The world in which Art Basel operates is changing constantly in unpredictable ways. Shortly before their last art fair ended, their largest rival was acquired by a big Hollywood talent agency. Shortly after, British voters approved Brexit. And the German government passed a new law requiring that an exit visa must be obtained for any work of art that is more than 75 years old and that is sold to a foreign buyer for more than €300,000. All of these actions will likely have significant impacts—probably negative—on Art Basel, but exactly what they will be is unknown. To function effectively in an environment like this requires a learning organization with an experimental culture. But if you want employees to experiment, a leader needs to be comfortable with failure. He or she also must be willing to delegate: if you want a team to make decisions, you must give them decisions to make. A good leader should make as few decisions as possible. In fact, a leader needs to get out of managing the “daily business” of the organization to focus on making only the decisions that only the leader can make and building the relationships that will help deal with future problems. By forcing others to make decisions, by asking questions rather than providing answers, by clearing away obstacles to success, and by sharing as much information as possible, a leader creates agency. Not all leadership tasks are pleasant. It may be necessary to drive out of the organization people who need to be micromanaged. The leader may also need to make decisions that others will not understand. But when Spiegler says “no,” he feels a responsibility to explain why, and to indicate that he may give a different answer in the future and that it is OK “to ask again” when the situation may have changed. A huge factor in leadership is providing motivation. In a literal sense, what Art Basel does could be seen as “helping oligarchs trade (expensive) trinkets with each other,” not a mission that will inspire anyone (except, perhaps, oligarchs). But the organization’s mission can also be framed as “to become the leading global platform for exchanges that drive the art world forward in an inspiring and sustainable way,” or as “Art is important, and governments won’t pay for it. So, Art Basel connects artists to patrons all over the world.” Essentially, Art Basel does things on a global level that no one else can do, allowing artists to find collectors who will enable them to continue their practice, which is surely an inspirational mission. In fact, the best mission statement does not sound like a mission statement. A final challenge for a leader in the whitewater world is to understand the differences between how to function inside vs. outside of the organization. Internally, it’s good for a leader to show vulnerability, to ask questions. But the external world still wants to see a strong leader who is confident about what he or she is doing, who is prepared to accept responsibility for everything that happens and to be either praised or blamed for it. Even though it’s important to delegate, it’s hard to do: the leader may give up control but still must be accountable for the results. Despite all of this, some things do not change. 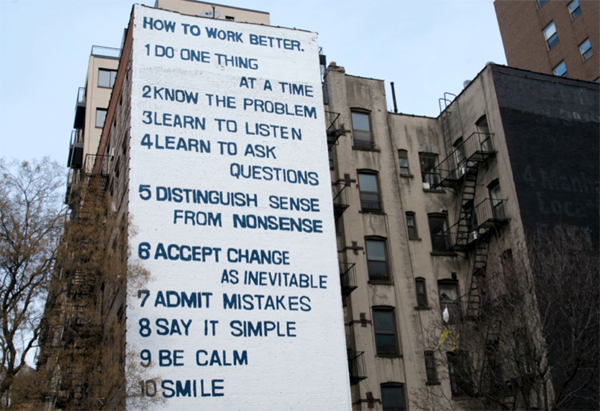 Spiegler shared the messages contained in an artwork created by a Swiss artist duo, Fischli/Weiss, based on a list of ten ways to “work better” that they found on the wall of a ceramics factory in Thailand (Figure 3). The final discussion focused on two key roles for a 21st century leader: recruiting and retaining the right people, and then empowering them to do their jobs well. While the first of these roles, recruiting high quality talent, may sound simple, in practice it is not. Marc Spiegler commented that an ideal job candidate would have high intelligence, a good attitude and relevant experience for a job. But if someone has the first two qualities, he is willing to let the third one go. If you can hire people who are smart and will fit in well with a team, they will quickly learn what they need. Hiring the “right” people is never easy and it has gotten even harder in the age of electronic CVs. John Kunzweiler described meeting a job candidate who did not make a positive first impression: he looked “schlumpy,” had mediocre grades, and could point to few accomplishments. But during his interview, he talked about his experience being a third string player on his school’s football team who never played in an actual game and never earned a letter. But he described what he did to keep himself motivated, ready to play if he was called on. Kunzweiler hired him. While it is very possible to be misled by a resume, it is always worthwhile to ask a candidate, “Who are you?” and to listen to their stories. People usually get hired for their hard skills, but are more likely to be fired for a lack of soft skills. Caroline O’Connell illustrated this point by describing what happened when a member of a team she was leading decided to leave the company and she had to decide how hard to work to keep that person. To help her clarify her options, she sat down and wrote out a list of core principles for her team (e.g., the quality of the individual is paramount, value creativity and innovation, never rest on the status quo, be a strong team player, value the contributions of each of your teammates). When she compared the list to the person who was intending to leave, she quickly realized that that person didn’t fit with the values of her team. Given this experience, she suggested that it can be useful for leaders to “look around the table at the people that they are working with” and ask if they would hire them again. If the answer is “no,” then it is important to do something about it. Putting together teams that work together well may, in fact, may be more important than hiring superstars. A few years ago, Google’s HR department did a careful study of the characteristics of successful teams. After studying the performance of hundreds of teams, they concluded that “who is on a team matters less than how the team members interact, structure their work, and view their contributions.” On the highest performing teams, there was no dominant person but rather a balance in the amount of input from each member of the team. In addition, team members felt that they could take risks, that they could count on other team members when needed, that the work they were doing was personally important to them, and that it mattered. Another study of team performance done by Deloitte in Australia started from the assumption that the most productive teams would consist of tightly knit groups of people who had worked together over an extended period of time. But, according to John Hagel, it turned out that the most successful teams had both a high level of internal interactions and a high level of external communications. In other words, even while they worked together, they actively reached out to get external input. Hagel also asserted that too much harmony on a team can be counter-productive. When he visits a new organization, he uses a simple test to determine how healthy it is: If he looks in conference rooms and sees people who are working together are all smiling and nodding, it is a clear sign that the organization is dysfunctional. But if people are pounding on the tables and arguing with each other, it is a healthy organization. The key ingredient here is “productive friction” which allows people to disagree with each other respectfully in the search for the best solution. In organizations that are seeking to maximize efficiency, friction of any kind is a bad thing that needs to be eliminated. But if the goal is learning and innovation, a certain amount of friction is very useful. Perhaps the biggest challenge for a leader is in learning to do less rather than doing more, and to get out of the way to allow individuals and teams to do their work. As Gaurav Tewari put it, “Leadership is about creating conditions that empower people to make decisions.” Stanley McChrystal concurred, adding that “if a leader is doing a lot, it’s often to the detriment of the leading that they should be doing.” At JSOC, his task was not to tell others what they should do, but rather to “orchestrate capacity”—in each individual, in each team, and in himself. Is it possible to provide broad access within an organization yet still maintain a hierarchy of authority? Is it possible for a leader to be vulnerable internally yet confident and strong externally? Is it better to make a bad decision quickly or a good decision slowly? Since leaders cannot make everyone happy with their decisions, how do they decide whom to disappoint?